The Women on the Map app uses Google Field Trip to push notifications when you are near a place where a woman did something historic. Kathleen, this made me think of your presentation on the lack of “women in bronze” & using VR apps to visualize women in history. Below are some final thoughts I had from before the last day of the City of Print program (Fellow Seminar Participants: This is the same list I e-mailed to the group on June 25, 2015). I look forward to continuing the conversation and collaborating further. Happy continued summer! Periodical studies matters and we need to use our ammunition to make it stand out more in our respective fields, especially as “new” media “take over.” It would be helpful to explore what a periodical is today and how that relates to what was seen in the past. We need to use digital tools creatively (as we’ve seen in various ways in the Institute) to animate interest in periodicals among our colleagues, students, and the general public. Many disciplines study periodicals, but more is needed to bridge our various fields and literatures (e.g. English, art history, communication, media/mass communication studies, etc. ), which will allow us to cross-pollinate and open up our research and teaching (like we’ve started to do with the Institute). Also, we should ask ourselves who and what perspectives might be missing from periodical studies (network theory comes to mind as we have seen many questions over the last two weeks about NYC periodicals’ connections within and beyond the city). “Modern” and “modernity” are highly contested terms, and I have enjoyed exploring their complex plurality. Moving forward, I will press my students and myself to push the limits of this term. Additionally, I will continue to ask questions about whom and what is served in modernity’s various manifestations. In thinking about the debates about modernity, I am reminded of insights about what (and for whom) is considered “modern,” as seen in Edward Said’s Orientalism, Maria Todorova’s Balkanism, and Dipesh Chakrabarty’sProvincializing Europe. Space and place are essential to understanding how and why periodicals developed the ways they did. We need to capture periodicals’ stories of space and place more (as we’ve been doing in our various wonderful tours). We can use the classroom to make this happen, too, by having students uncover “micro” periodical histories and geographies, which might link to larger networks that can be discovered through our continued collaboration after the Institute. Image from Paul du Gay, ed., Doing Cultural Studies: The Story of The Sony Walkman (Thousand Oaks, CA: Sage, 2013). An online bibliographic database or chart with links to various digital archives of periodicals across time periods and genres (let’s pool our resources!). An online bibliographic database or chart with details about where to find original periodicals in extensive collections (Do you want to know about post-WWII French and American magazine holdings in the US and France? Give me a call!). Creation of an H-Net listserv group dedicated to periodicals (if there is one already, I want to join!). The periodicals timeline sounds amazing, especially with our collective knowledge and resources. Maybe we could also develop interactive maps/timelines? Lewis Hine taught photography at the Ethical Culture school and published photographs of child labor for the Survey Graphic and other Progressive Era publications. His work for the National Child Labor Committee includes famous shots of newsies. 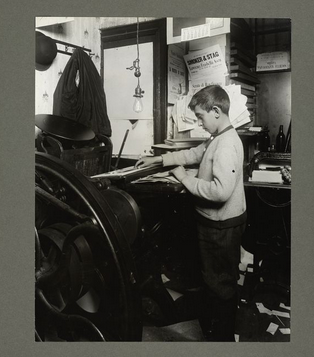 This 1913 image of a boy in a print shop is from the New York Public Library online collections. I’ve created a simple blog for all of the photos I took on my camera. Enjoy! 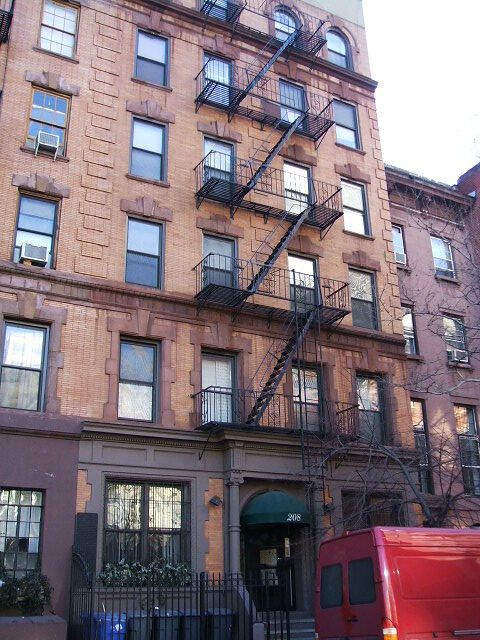 Hey folks, maybe I’m just having withdrawal from our fine two weeks, but I came across a story that combines the West Village’s literary past with print culture and battles over urban space that nicely suggest many of the themes we covered. 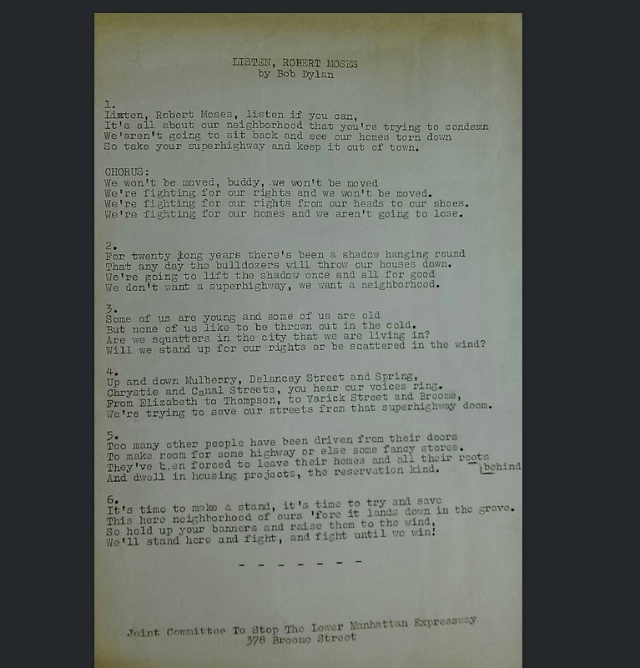 Not only that, but the lyrics below are from the Fales Library’s Tuli Kupferberg archive: A song written by Bob Dylan, protesting Robert Moses’ proposed destruction-by-highway of Greenwich Village.